A GUEST POST from my sister Aparna on her trip to Chandigarh. “Why don’t you try to write something for my blog rather than just sending me photographs…” That’s what my brother once told me. Taking up the same as a challenge, here I am, Aparna, writing my very first guest post for my brother’s blog. To beat the heat this summer, we planned our visit to Shimla, Himachal Pradesh. We took a flight from Ahmedabad to Chandigarh and travelled by car to Shimla from there. This gave us an opportunity to visit Chandigarh for a good 3-4 hours. Chandigarh as we all know, is a union territory and the capital of Haryana and Punjab. It was the first planned Indian city after independence and is well-known for its urban design and architecture. With beautiful yellow and purple blossoms thronging the roadside, Chandigarh gives a pleasant view even during the hot days of April. 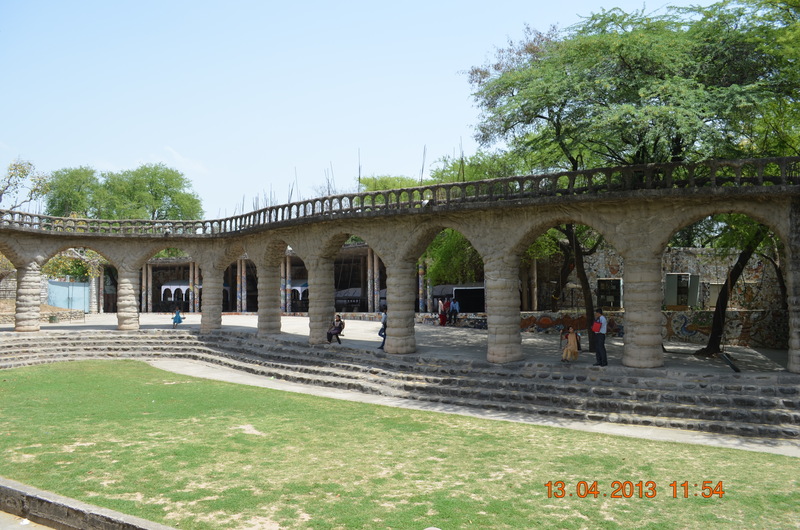 In this post I would like to write about the famous Rock Gardens at Chandigarh. 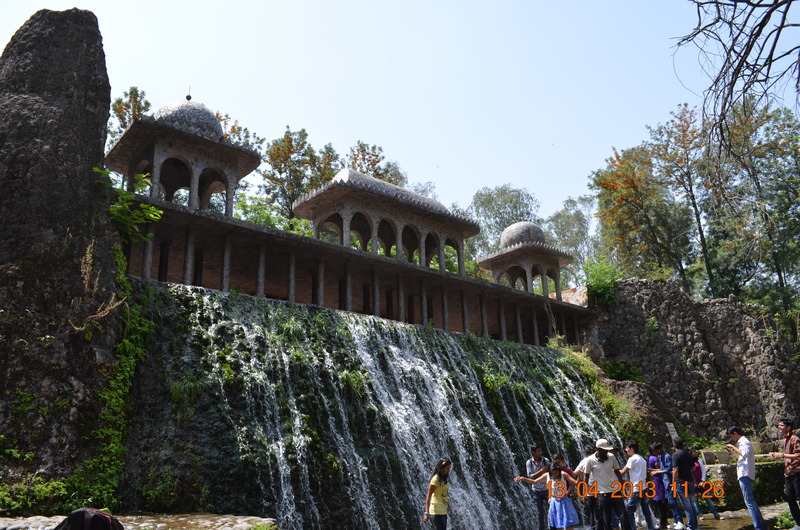 Many of us know that this city houses a sculpture garden known as the Rock Garden or Nek Chand’s Rock garden, named after its founder Nek Chand. Highly recommended by many of my friends, we decided to visit these gardens first. 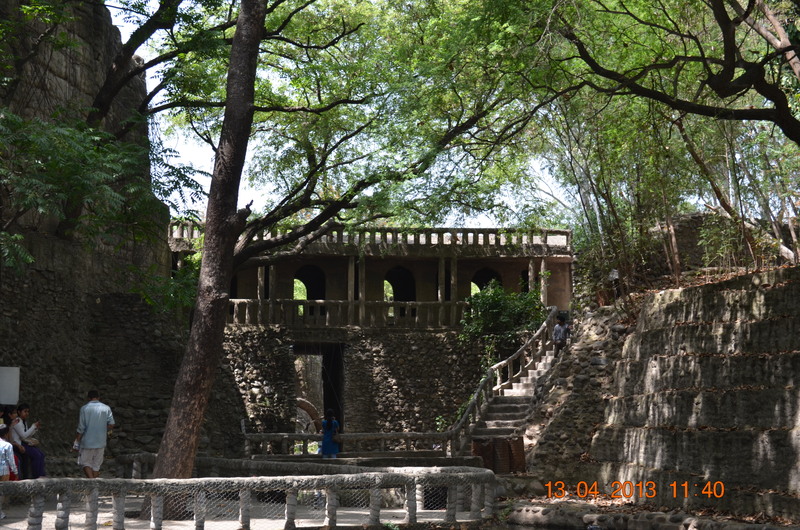 We reached the gardens at around 11 am on 13th April’13. Before I begin, let me give you a brief introduction of the story behind this beautiful man-made garden. 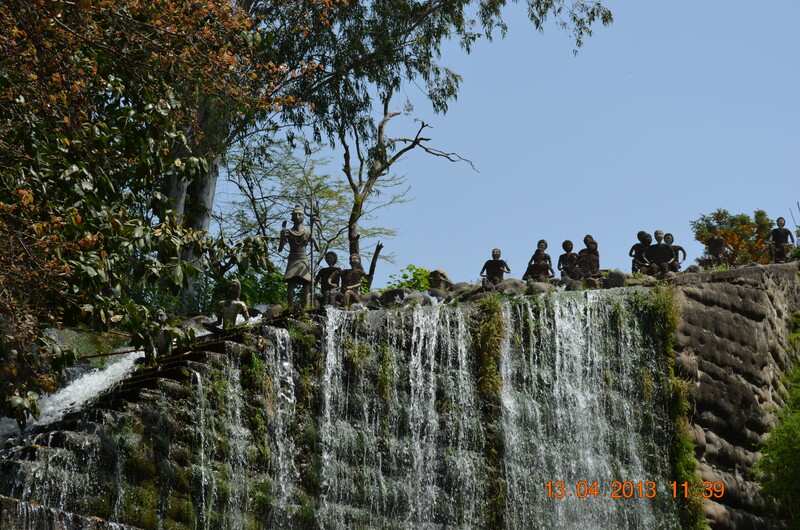 In 1957, Nek Chand, a government official, began developing the garden in his spare time. The garden was created out of industrial and home waste items. It is know that Nek Chand used to collect stones and debris from villages which were destroyed for construction of Chandigarh. In the 1960s, he worked alone secretly to make 2,000 statues out of the scrap. Nek Chand’s main motto was to use recycled waste materials like bottles, glasses, bangles, tiles, ceramic pots, sinks, electrical waste, etc. which generally go useless creating pollution and convert the same into something interesting. Initially his work was not accepted and considered illegal, but later on it got authorized with an official inauguration in 1976. Nek Chand was also awarded the Padam Shri by the Prime Minister of India in 1984 for his beautiful work with waste. This garden is now open to public and visited by a large number of people all round the year. With time, new additions have been made in the gardens to attract more and more public. We roamed around for about 2 hours in the gardens discovering newer and better masterpieces as we got inner and deeper. Previous Post Has honesty become irrelevant? Really very creative piece Aparna !!! Beautiful pictures and you have penned more beautifully!!! Hope to see more creative posts from you…. Excellent article & pictures Aparna, It shows what a single person can achieve, when he or she puts his or her mind to create something different.